The end of year is traditionally the time when SFT makes new releases of our main software products. It is a very busy time with everyone working energetically to meet various deadlines. All last minute changes and fixes need to be integrated and run through extensive checks to ensure that quality of the performance of the code is not compromised in all its aspects. As for any new release, a lot of valuable feedback is encouraged and expected from the user community in the coming weeks. In addition, the group participated strongly in the first “Data Science at the LHC” workshop and subsequently two group members gave a mini course in “Statistics and Machine Learning” in Brasil, as part of the EPlanet project. Both these events were held in November. More details on these activities are given below. substantial revision of the radioactive decay model such that atomic de-excitation is now used to handle fluorescence and Auger electrons. The next production release of ROOT, v6.08, is scheduled for the first half of next year. It will use multiple threads to accelerate for instance the reading of ROOT files. And of course we again expect several new features and improvements, such as in TMVA! The team is also starting to prepare for the longer term by announcing plans for a new major release, ROOT 7. This will be the first step to bringing ROOT's interfaces into the modern C++ world with the aim of making ROOT simpler to use and more robust. Watch out for blog posts discussing some of the new interfaces, and make sure to get involved by contacting us early: this is your ROOT! The CernVM team is preparing release candidates of the next versions of the main products, CernVM-FS and CernVM Appliance. These are due to go in production in early 2016. The next version of the file system will provide consolidation of the main features, focusing in particular on special setups, such as those encountered in supercomputers. The next version of the appliance will provide users with the possibility to create software environments compatible with the CentOS 7 Linux distribution, the latest validated version currently being deployed by the LHC experiments. It will also provide full support for container technology, making it easier to adapt the image to the diverse use cases addressed. In addition to being widely used by the LHC experiments, with about 400000 virtual machines started each month, the CernVM appliance and file system have been the enabling technologies behind the CERN Public Computing Challenge, which took place in the second half of November. The CernVM team is currently engaged in the organization of the next CernVM Users Workshop, which will follow the successful event held at CERN in March 2015. This will take place in the beginning of June 2016, most likely at RAL, UK. From Nov. 9 - Nov. 13, the first data science at the LHC workshop was held at CERN (see Photo 1). 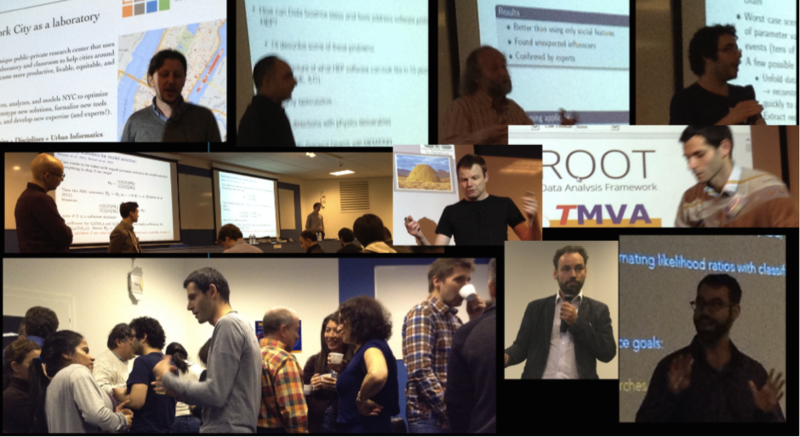 It brought together leading experts in the field of machine learning in particle physics and other areas. The number of registrants exceeded expectations and contributed to an exciting and productive atmosphere. The workshop featured talks by all LHC experiments about their advances in the field of machine learning, new ideas in data analysis, software and hardware, talks from Google DeepMind, Idsia and others. Currently hot machine-learning topics, such as deep learning, were discussed in the particle physics context. The workshop also featured afternoon software tutorials, including Rootbook (Root-integrated Jupiter notebooks) demos of new features in TMVA, machine-learning toolkit in Root. Participants were very excited about Rootbooks, which proved to be a great learning tool, running on dedicated servers generously provided by the CERN OpenStack project. 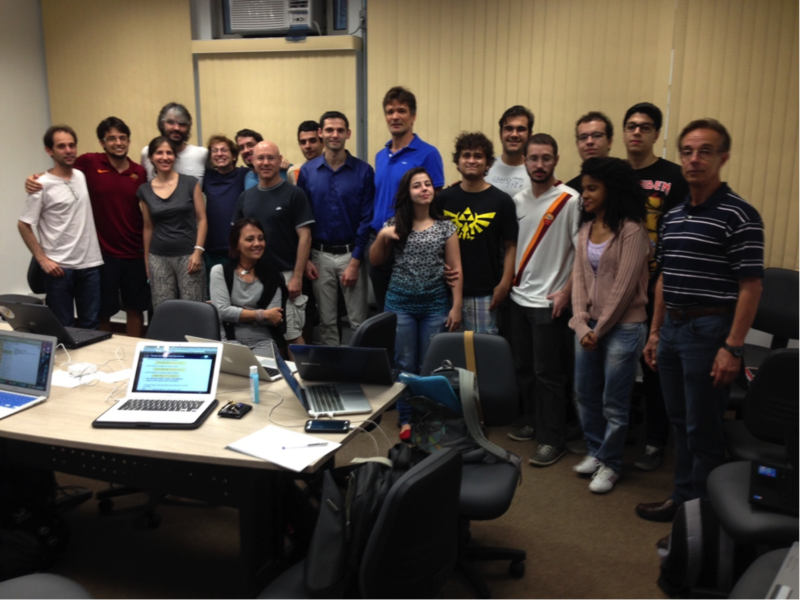 From Nov. 15 – Nov. 30, a mini-course on Statistics and Data Analysis was held in UERJ in Rio de Janeiro, as part of the EPlanet program. The course featured lectures on Root, basics of statistical data analysis, and fundamentals of machine learning. In addition to classroom lectures, taught by experts from CERN (S. Gleyzer and L. Moneta) there were practical tutorials based on Rootbooks. One of the many highlights of the course was the use of mobile phones to run Root and TMVA examples with Rootbooks. The course was very productive and well attended by students, engineers and professors from several Brazilian universities and research centres: UERJ, UFRJ, and UEA in Manaus (see Photo 2). Follow-up collaboration and involvement of scientists from Brazil in CERN Machine Learning activities is planned.